Paul W. - "Thank you for restoring my confidence in my RV. I really feel that I received a real value for my money". Quick, Accurate Repairs by Factory Trained Technicians. 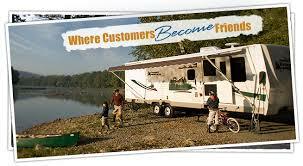 Give us a call at Lebanon RV Center. Or just stop by for a cup of coffee and some friendly discussion. Have a question? Stop by or give us a call. We really enjoy the camping adventure and look forward to the opportunity to help fellow campers.